Kyrgyzstan holds unleashed potential for mountain bikers. If your prepared to be creative, the possibilities are endless. It’s Tienshan and Pamir Mountains are littered with networks of abandoned dirt roads, tight and winding trekking trails, mountain passes, river paths and our favorite – animal carved single track! For centuries nomads have grazed their herds in the high altitude valley’s, driving them on horseback through pastures and over passes. 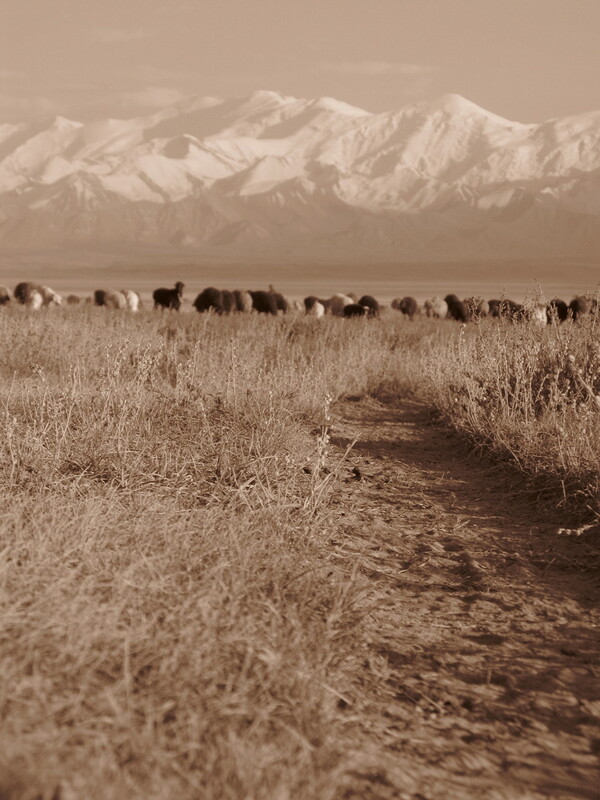 Some single track has been cut by horsemen travelling between yurt encampments, others have been cut by herds traversing the hills for feed and water. Either way we love heading out into the middle of nowhere – the more remote the better – to find untamed single track and see what we can ride. See an online article, Soul of Manas, about a 2015 exploratory MTB expedition we put together in collaboration with Secret Compass. Join us again in 2016 to Single Track the Single Road! This is the toughest, most challenging yet ultimately most rewarding of our bike expeditions. 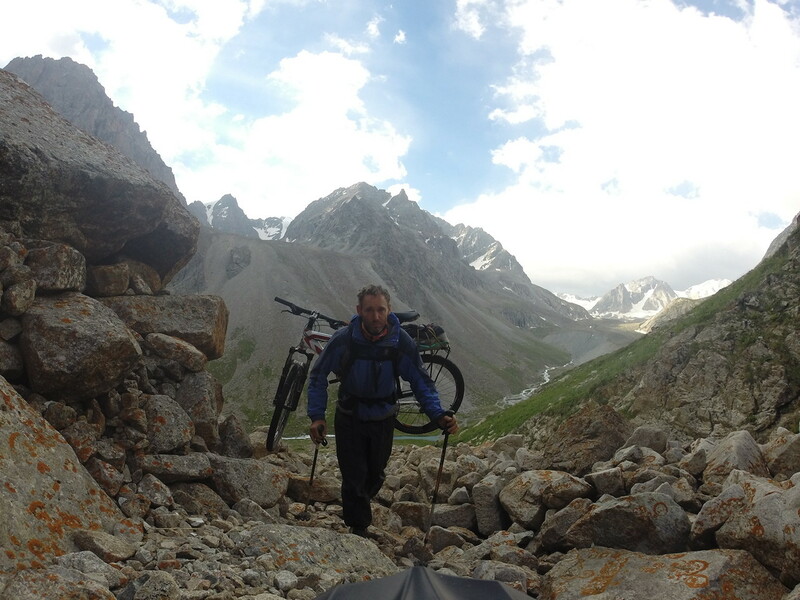 We transport to a start point and ride/trek our way through the mountains expedition style searching single track. Often exploratory, we set camp in a new spot each night. We either go self supported or with pack-animals to help carry gear. Sometimes we find a bit of road, sometimes a horse trail, sometimes nothing. It’s not a matter of if, but when you will have to carry or push your bike up a steep pass or over un-rideable rocky terrain before being able to shred the other side. Be prepared for river crossings, scree, moraine, snow, sun, smiles and epic single track. Good strength and fitness is essential. Focused on endurance and mostly commutable tracks instead of pass hopping and scree scrambling with your bike on your back. This is more dirt road riding – we stick mostly to known tracks but sometimes find flanking cuts of single track. This can also be super tough, but no carrying your bike – hopefully! This can be self supporting with panniers or with vehicle support. Camp is set in a new place each night, (or we can hightail it between village homestays or yurt camps) unless we take a rest day, or decide to do a circular ride on a particular day. Essentially we base camp in a valley and go out on day missions exploring downhill possibilities. We drive, ride, hike up as far as we can then rip down. When we’ve explored one location, we can shoot off to another and start again – or we can attack multiple locations from the same base. This can even be run out of village homestays, yurt camps or small town accommodation – so you can enjoy some (relative) home comforts if you don’t want to camp. 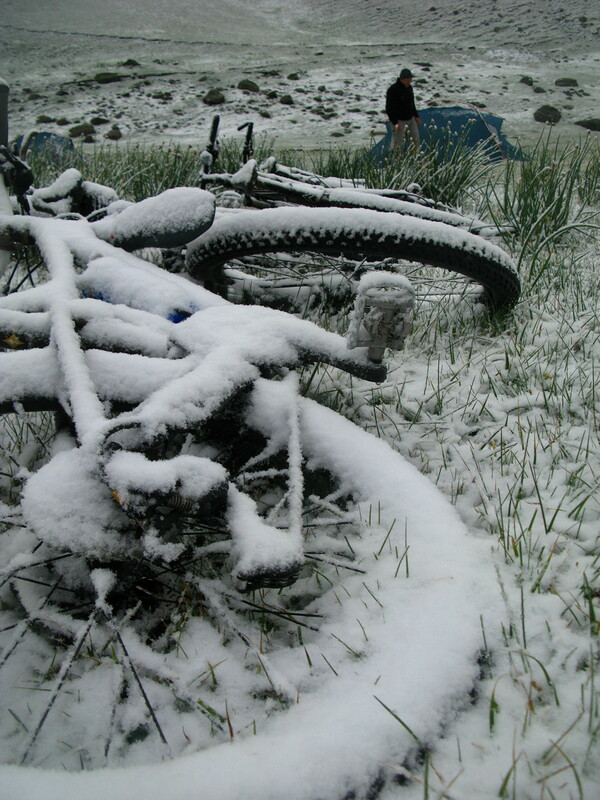 Tienshan Summer Snow! Be Ready for Anything!